Shakespeare by the Sea has been producing and performing the Bard in and around St. John's for the last twenty-five years. For our 26th Season we've decided to make Shakespeare fun and affordable for everyone. 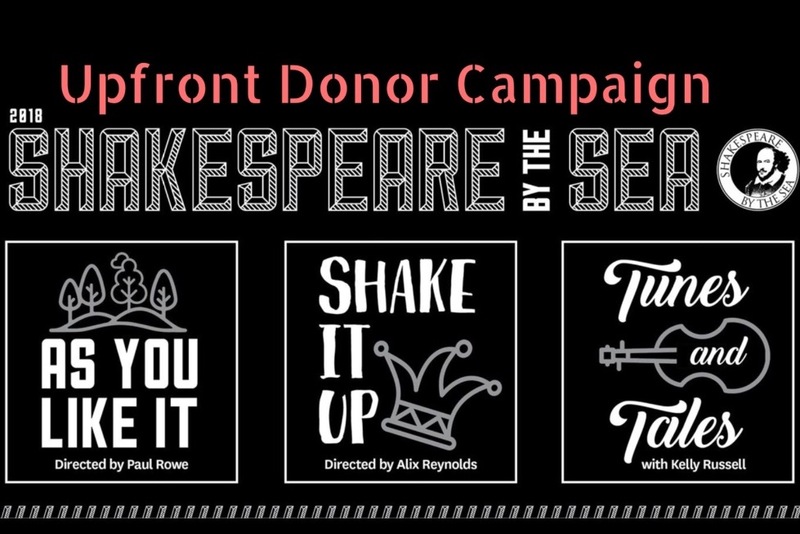 Our two outdoor shows AS YOU LIKE IT and SHAKE IT UP will be by donation only/pay what you can. AS YOU LIKE IT plays weekend dates in three different city parks and SHAKE IT UP, our kids show, will liven things up on Saturdays at the St. John's Farmer's Market. But, of course, without advance tickets sales, we need to find revenue to meet our ongoing production expenses. This is why we are launching our UP FRONT DONOR CAMPAIGN . We invite you, especially if you are planning to join us in the park or at the market this year, to pay "up front" by making your donation today instead of when you come to the show. You can show up any time at any location to enjoy any show. Our goal is to raise $10,000 by mid-July. Your contribution of $5 to $25 will go along way towards ensuring that Shakespeare in St. John's in 2018 will be fun and affordable for everyone. Thank you for your support for the work of Shakespeare by the Sea.